On the left is a writing sample from a second-grader who is reading at grade level. 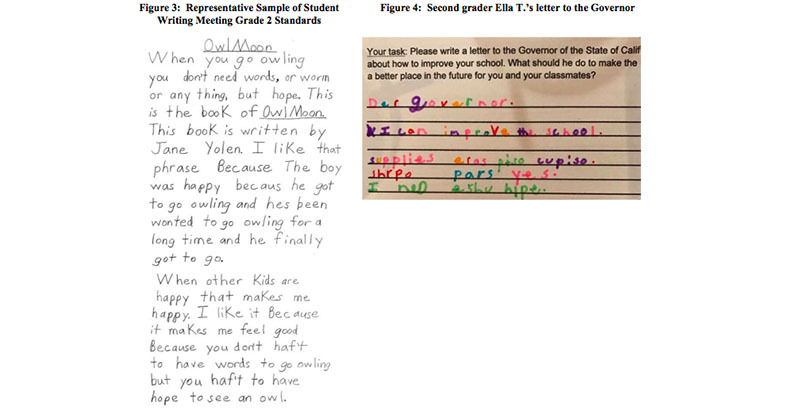 On the right is a letter written by Ella T., a second-grader and a plaintiff in the lawsuit, who is not reading at grade level. Is a school in California where only one fourth-grader is able to read at grade level violating students’ constitutional guarantee to a basic education? A new lawsuit could get the green light within days to move forward with this claim, that the state’s Department of Education is depriving low-income students of equal access to learning to read and write. The suit claims to be the first in the United States to seek recognition of the constitutional right to literacy. 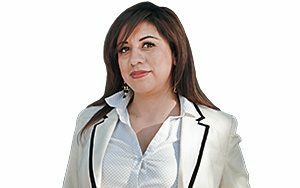 Superior Court Judge Yvette Palazuelos will rule within days on the state’s petition to dismiss the lawsuit. She heard both parties’ arguments last week in Los Angeles. A similar suit in Michigan was dismissed earlier this month by a federal judge who ruled that access to literacy is not a fundamental right. That class-action lawsuit, Gary B. v. Snyder, claimed that literacy is a right guaranteed by the U.S. Constitution. The suit represented seven students attending Detroit public schools and sought literacy reforms in Detroit’s school system on instruction and intervention. It was filed by the same Los Angeles–based law firm that is behind the California case, Public Counsel, which said this week that it plans to appeal the Michigan ruling. What is the California lawsuit about and who does it represent? Ella T. v. State of California was filed in Los Angeles in December 2017 on behalf of 10 students — mostly low-income and students of color — attending three schools in three districts: LA Unified’s La Salle Avenue Elementary, Van Buren Elementary School in the Stockton Unified School District, and Children of Promise Preparatory Academy, a charter school authorized by Inglewood Unified. The lawsuit names as defendants the State of California, the State Board of Education, the California Department of Education, and state Superintendent of Public Instruction Tom Torlakson. Why was this lawsuit filed? “This is a case about access to literacy, and what we found in those three schools is that the schools are not able to teach children how to read and this ends up harming children for a long time,” Alisa Hartz, a Public Counsel attorney, said this week. The lawsuit states that in the 2016-17 school year, only 4 percent of students attending La Salle Avenue Elementary scored proficient on state tests in English language arts, meaning only 8 out of the 179 students who took the test could read and write at grade level. In the fourth grade at Van Buren Elementary in Stockton, only one student scored proficient. Among the 200 largest school districts in the country, California has 11 of the 26 lowest-performing districts on measures of literacy and basic education, according to the lawsuit. Stockton Unified School District is the third-lowest-performing district on that list. Why is the state seeking to dismiss the lawsuit? The petition says that even though the state had developed a literacy plan in 2011-12 to submit to the federal government, the plan was not funded and the state was not required to adopt such a plan. It also points to the state’s “extraordinary efforts” to “provide millions of dollars to local school districts to address their students’ educational needs” through the Local Control Funding Formula, California’s mechanism for determining how much money school districts get. In its petition to dismiss the case, the state maintains that a statewide literacy plan is neither constitutionally or statutorily required. In the 2012 plan, the state Board of Education identified “a literacy crisis” in California’s school system. The “Striving Readers Comprehensive Literacy Plan,” by the state’s own literacy experts, concluded that the evidence supported a sense of urgency for the state to implement a literacy plan. The California Department of Education did not respond to requests for comment. A spokesman for the department previously has said the state will not comment on the case. Hartz, the Public Counsel lawyer, said that if the judge decides favorably, they will go into preparation for trial set to take place in October 2019. “There will be a lot happening before then in terms of discovery, preparing documents, taking depositions, everything in preparation for the trial,” she said. If the court rules in favor of the plaintiffs, what would the state be forced to do? ● schools provide conditions that allow for learning, such as social-emotional support. How would the case impact California families? One Stockton resident said his schools’ failure to teach him to read put him on a path to prison. Raymond Aguilar, a member of Fathers & Families of San Joaquin, said in a news release when the suit was filed that at age 16 he was reading at a fifth-grade level. “A fifth-grade reading level does not let you read your high school history textbook or write an essay or read the instructions for a chemistry experiment. I couldn’t do any of those things as a 16-year-old should and instead was forced down a path that led to incarceration,” he said.